Okay—so, the Brett Kavanaugh drama is heating up. Christine Blasey Ford has lobbed a grenade at Judge Brett Kavanaugh, accusing him of a drunken episode in which he attempted to sexually assault her at a party some 30-plus years ago. Kavanaugh was 17-years-old. It’s a serious charge—and it should be dissected before the Senate Judiciary Committee. Give Ms. Ford her day to detail this episode…if she can find the time. The committee and Ford’s lawyers, one of which, Debra Katz, is publicly anti-Trump (she’s and more of an operative) are still trying to hash out the details. Par for the course, right; it’s all about getting that delay. Delay for the midterms in an effort to run out the clock on this Supreme Court nomination. Democrats think they can increase their weak position on the Hill by weaponizing a possibly false charge to win more clout in D.C.
Okay—well, she didn’t tell anyone before her couple’s therapy in 2012. Uh, that’s a lie. She reportedly told someone days after this allegation because Christina King Miranda said she remembered it being the talk of the school, though she doesn’t know Ford and has no first-hand knowledge of the account. She believes Ford, however. Uh, that’s tells us nothing, lady. “I do not have first hand knowledge of the incident that Dr. Christine Blasey Ford mentions, and I stand by my support for Christine. That's it. I don't have more to say on the subject, “ she wrote on Twitter before deactivating her account. In addition to Brett Kavanaugh and Mark Judge, whom she called acquaintances she knew from past socializing, she recalls that her friend Leland (last name then was Ingham, now Keyser) was at the house and a friend of the boys named PJ." 2) The email wants a comment from him. The subsequent story would reveal Christine Ford's name, and give details of the supposed "assault." 3) One part of the email to Judge reads: "In addition to Brett Kavanaugh and Mark Judge, whom she called acquaintances she knew from past socializing, she recalls that her friend Leland (last name then was Ingham, now Keyser) was at the house and a friend of the boys named PJ." 6) Wait, say what? WaPo reports publicly that Ford says it was "four boys,"even after WaPo reporter tells Judge that Ford had told her it was three boys and a girl. 7) So first, huge problem: This was just a week ago, and we have Ford giving two different accounts of who was present. Four boys. No, three boys, one girl. Either way, therapist notes from 2012 definitively say four boys, which Ford didn't dispute. But now... a girl! 8) Other problem: WaPo's reporting. Reporter has for a week had the names of those Ford listed as present. One is a woman. Yet it writes a story saying FOUR BOYS. Why? Maybe a mistake. But if so, why did WaPo never correct that narrative? 9) What, you can't find Keyser? She has lived in the DC area a long time. The paper had no trouble tracking down the other two men (btw, who also denied such party). And why not publish Keyser's name? It published the other men's names. 10) In its most recent update tonight, WaPo writes: "Before her name became public, Ford told The Post she did not think Keyser would remember the party because nothing remarkable had happened there, as far as Keyser was aware." 11) Wow. "Before her name became public, Ford told..." That is WaPo admitting that it had the name, and had Ford's response to what would clearly be a Keyser denial, but NEVER PUT IT OUT THERE. Again, why? A lot of people have a lot questions to answer. Before her name became public, Ford told The Post she did not think Keyser would remember the party because nothing remarkable had happened there, as far as Keyser was aware." So, Ford can’t remember how the party came about, how she got there, who owned the house, she did tell someone about this alleged encounter, and the witnesses to this supposed attempted assault have denied her story. Add in the fact that this is a 30-plus year allegation, yeah; this story has more holes than a slice of Swiss cheese. Also, even some liberals who are opposed to Kavanaugh are not comfortable using teenage antics as the sole basis to block nominees. The Senate Judiciary Committee reached out to Leland Ingham Keyser, a friend of Christine Blasey Ford. Ford claims Kavanaugh pinned her to a bed when he was drunk, covered her mouth, and tried to remove her clothing at a party in the early 1980s when they were in high school. Keyser’s lawyer, Howard Walsh, responded to the committee late Saturday in a written statement. “Simply put, Ms. Keyser does not know Mr. Kavanaugh and she has no recollection of ever being at a party or gathering where he was present, with, or without, Dr. Ford,” the attorney wrote. Keyser — a lifelong friends of Ford’s according to Walsh — is the third individual to deny suggestions that they were at the alleged party. Mark Judge and Patrick J. Smyth have also issued statements rejecting Ford’s recollection. My, oh my, this is getting messy…for Democrats. One could see why Sen. Dianne Feinstein (D-CA), who set all of this in motion by referring Ford’s letter, which her office received in July, to the FBI at the last minute. The timing was suspect; it was dropped when Kavanaugh’s confirmation as all but assured. It still may be, albeit on a rockier trajectory. If they’re asking to negotiate, then they haven’t accepted Grassley’s terms. Hearing that the other woman at the alleged party (the one missing witness, as identified by the accuser) has come forward & says she doesn’t know Kavanaugh & has no recollection of attending any party that he did. Four alleged witnesses. All four do not corroborate her story. Around 1982 somewhere in Montgomery County I was the victim of an assault. I'll name three witnesses, all of whom say it never happened. 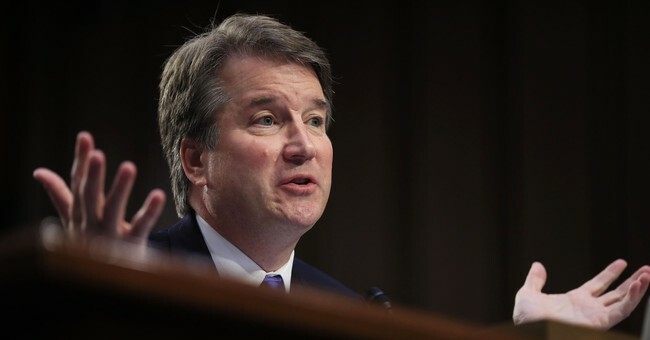 The actions of Ms. Ford are suspect, as she retained a lawyer and took a polygraph administered by an unknown former FBI agent, despite wanting to remain anonymous, or something. These seem to be actions one would take in preparation of going public. It looks like a politically motivated hit job—and it probably is. The credibility of this story has more bullet holes than Bonnie And Clyde and Senate Republicans should mind the clock. It’s no time to have an Andy Reid moment. We all know the Left’s playbook here. Get moving on this nomination. The Democratic Party’s base was always going to be motivated with or without Kavanaugh. They hate Trump. Enough said. The GOP has to be mindful of the base viewing them as being weak by catering to someone whose serious (and alleged) allegation of sexual misconduct might not be credible, and one who plays the Democratic tune of delay, delay, and delay some more. That could depress turnout. That could make a lot of Republicans, who voted for Trump despite his moral shortcomings and divergence from some of the GOP orthodoxy on policy, stay home. Why? It was judicial appointments that got him to the polls. Don't forget that exit poll, GOP. On a side note, the fact that Trump wasn’t Hillary Rodham Clinton was a good enough reason to vote from him in 2016. Even Feinstein tripped up, saying to the effect that the allegations might not be true. Of course, she backpedaled, but whether this was a genius move executed by Democrats to kill this nomination is looking more ridiculous right now. If this bomb was meant to destroy this nomination, it's looking more likely that the Left lit the fuse too early.